This complex, many-handed task aboard the bark CARRIE WINSLOW on a voyage from Portland to Buenos Aires allowed the captain’s daughter to create an iconic photograph of a centuries-old scene. Montgomery first went to sea at fifteen, when she was learning photography. By the time she took this photo, she was fairly skilled. Here she silhouettes the mast; you can barely see the lower part of mizzen mast behind the main, together with a staysail. Looking at the platform at the top of the main mast and the yards, you can see that the photograph was taken from the WINSLOW’s port (left) rail as the yards swung to the wind coming over the starboard (right) quarter. Bright day has faded out detail aft and distracting rigging has faded into the light. More of Ruth Montgomery’s work is on view in Through Her Lens: Women Photographers of Mid-Coast Maine, 1890-1920. Good photos of working aloft are rare. Setting and furling sail happened as needed by the ship, not necessarily at a good time for photographers. Large format cameras and glass-plate negatives were not nimble tools for capturing this. Changing a sail, however, was a well-planned and scheduled event. 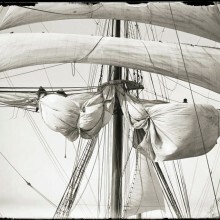 Ruth Montgomery, by this time an experienced sailor, could and did carefully plan her photograph, creating a memorable view of sailors working high above deck.